KILAUEA, Kauai » A 27-year-old Kilauea man was arrested after allegedly holding off police for hours yesterday from the inside of a police car. Kaleo Martin brandished a rifle and was able to commandeer a police car when an officer responded to a domestic disturbance complaint at his family's home on Kilauea Road near Titcomb Road about 5:15 a.m., police said. Kauai Police Department Capt. Ale Quibilan said Martin was "very, very incoherent" as police tried to talk to him, although at some point he did ask to talk to the mayor. "We can't seem to make him understand" the gravity of the situation, he added. It started with a domestic argument and a call for police but soon turned into a standoff. Police were eventually able to coax him out of the police car and used a Taser on him at about 10:25 a.m., but not before Martin "hacked up" the car with a machete, Quibilan added. 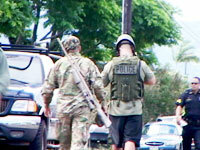 It was the first time Kauai police have used a Taser to subdue someone. They were distributed to a number of officers earlier this year. 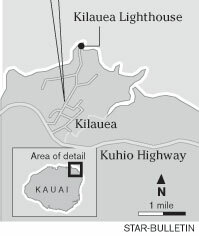 About 25 police officers eventually responded to the scene and closed Kilauea Road, as well as nearby Kauai Christian Academy and the Kilauea Lighthouse, police officials said. About a dozen people in homes around the scene were evacuated, and others in the neighborhood were told to stay inside and lock their doors. Martin has been charged with numerous counts of felony terroristic threatening and criminal property damage, as well as unlawfully entering a motor vehicle and family abuse. He was being held at the police cellblock. Bail had not been calculated as of yesterday afternoon, police said.